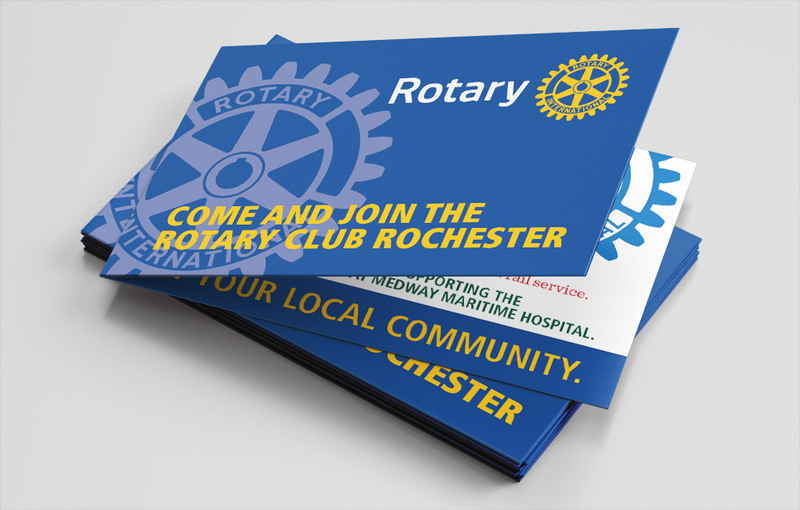 The Rotary Club of Rochester is always looking to recruit new members and we often help with quick promotional pieces like this pocket sized 4 page flyer. Rotary is a global network of 1.2 million neighbours, friends, leaders, and problem-solvers who see a world where people unite and take action to create lasting change – across the globe, in their communities, and themselves. The Rotary Club of Rochester describes itself as ‘a service club of inspired individuals whose contributions improve lives in communities locally and worldwide’. The club contains a diverse group of people from the local community that the club serves. Club members are volunteers who work to tackle initiatives such as Mental Health Week and Autism Awareness Week, along with local community projects like supporting the homeless at Christmas. They have used their passion, energy, and intelligence to take action on wider projects from literacy and health awareness to helping to eradicate polio worldwide under the motto ‘Service Above Self’. While membership of a Rotary club is by invitation only, The Rotary Club of Rochester is keen to energise local people and find those with similar interests. They are pleased to hear from interested people, to tell them a little more about their weekly meetings and invite them visit. Our pocket sized flyer is handed out to interested parties at public events. It gives a quick overview of the initiatives The Rotary Club of Rochester is currently working on along with some details about many social events it runs throughout the year.